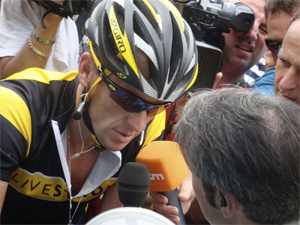 That’s what Lance Armstrong told filmmaker Alex Gibney, just hours after his Oprah interview. Perhaps that’s why Gibney — whose films usually take an omniscient point of view — puts himself into The Armstrong Lie. “I” and “my film” make frequent appearances as Gibney explains his personal and professional frustration with Armstrong. He kept his objective detachment in films about Jack Abramoff, Eliot Spitzer, and Afghanistan atrocities, but mess with his sports and Gibney takes it personally. Some of the footage that would have been in Gibney’s fanboy documentary remains, and it makes for some pretty good background on Armstrong. After Armstrong’s famous bout with cancer, he had lost a lot of weight. His trainer shifted power from Armstrong’s muscles to his cardiovascular system by setting a higher cadence in a lower gear. That’s the sort of thing that would have made this film pretty interesting, even without the big lie. Of course, it takes a back seat in the finished documentary. I had never felt emotionally attached to either the accusations or denials. Part of what Gibney’s film does, then, is force people like me to see just how charming Armstrong can be on camera. He is a handsome cancer survivor with a beautiful wife, and who donated lots of money to sick children. In every denial Gibney shows, you really want to be on Armstrong’s side. But Gibney also shows how obvious it was, in hindsight, that Armstrong was doping. He had hired the help of an Italian trainer named Michele Ferrari, whose methods were known to be against the rules. His teammates were accused, and eventually admitted to doping. There was a whole culture of doping, and nobody didn’t partake, except, defiantly, Lance Armstrong. At least until his 2013 admission. A few key points make Armstrong’s lie morally frustrating, and for me make The Armstrong Lie worth seeing. First is the realization that charisma and popularity will get you far. Of all the riders who doped, Armstrong was able to maintain the lie as long as he did because people wanted to believe him. He was a hero. People get angry when someone criticizes their heroes. (If you don’t believe me, read the hate mail when a film critic dislikes someone’s pet film.) Gibney shows us a Nike commercial from 2009 comparing Armstrong’s critics to people who insult war veterans (Google “nike lance armstrong driven commercial” if you want to see it). Evidence doesn’t stand a chance against that. Humanity needs to evolve past conflating charisma with trust if we want to do better. Second is the damage Armstrong did in defending the lie. The biggest victim I know in all this is a sportswriter named David Walsh, who with The Sunday Times lost a libel suit in Britain for allegations against Armstrong. The fact that there was a culture of doping when Armstrong arrived on the scene makes it understandable that he would have adapted to the environment. But to willfully and fraudulently damage someone’s reputation and livelihood to cover up your own lie is reprehensible. This is not something that good people do. Gibney touches on both of these points, and more, in a surprisingly emotional film. Outrage and betrayal are great subjects for documentaries.